Louis Grell (1887 – 1960) was born in Council Bluffs, Iowa, and showed artistic talent as young as age two. At the age of 12, Grell’s parents sent him to Hamburg, Germany, to live with his grandmother to study art. He continued his studies in Munich and Paris. After World War I, Grell returned to the United States where he began to design stage sets for Broadway in New York City. Grell also worked as an instructor at The Chicago Academy of Fine Arts, where Walt Disney was a student. He also taught at the Art Institute of Chicago where he exhibited 25 times. Union Station, St. Louis, Mo. As the demand for large murals in theaters diminished Grell turned to religious subjects. 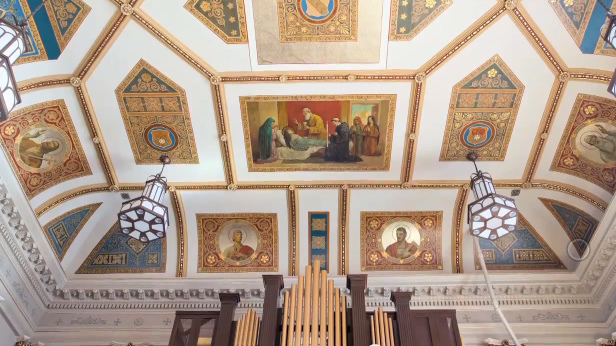 His work on the ceiling at Assumption church is an example. A portion is shown here.